Cleaning your home offers an opportunity to get rid of old things and bring a sense of refreshment to your environment, but the process may not always be so pleasant to the senses. Often times, household cleaning products can irritate the eyes, nose and throat and trigger allergic reactions or even an asthma attack. Sneezing, coughing and itchy skin can be symptoms traced back to chemical allergies found in everyday cleaning products. We are exposed to hundreds of different chemicals in the products used every day to clean our homes, cars, or offices. 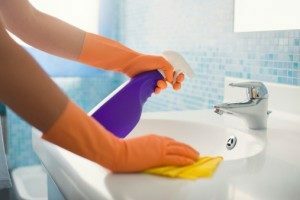 If you read the list of ingredients in these cleaning products, you may be surprised to find that many of these ingredients are potentially toxic chemicals which can trigger asthma attacks. According to the American Lung Association, some products release dangerous chemicals, including volatile organic compounds (VOCs). Other harmful ingredients include ammonia and bleach. VOCs and other chemicals released when using cleaning supplies contribute to chronic respiratory problems, allergic reactions and headaches. The American Lung Association suggests reading all labels on cleaning supplies and household products before you buy them. Choose products that do not contain or have reduced amounts of VOCs, fragrances, irritants and flammable ingredients. Products that are labeled “green” do not necessarily mean they are safer. Another helpful tip: when using cleaning or household products, keep the area well ventilated. Never use cleaning products in a small, enclosed space and open windows and doors.